For years, the industry rule of thumb has been that most blog posts have a life cycle of approximately 30 days. What methodology led to this 30-day theory? Was it just a random guess based on some marketer’s gut feeling or anecdotal observations? Who knows. Our Florida neighbors to the south, IZEA, recently commissioned a study to scientifically measure just what the lifetime value of a blog post really is. With the help of the Halverson Group, 62,863 blog posts were gathered, of which 500 were randomly sampled. When tracking the performance of these posts over time, the Halverson Group made three very interesting discoveries. In the case of the widely accepted 30-day life cycle of the blog post, Flint’s statement rings true. When calculating impressions, the team found that the lifecycle of a blog post isn’t 30 days, 30 weeks or even a year. 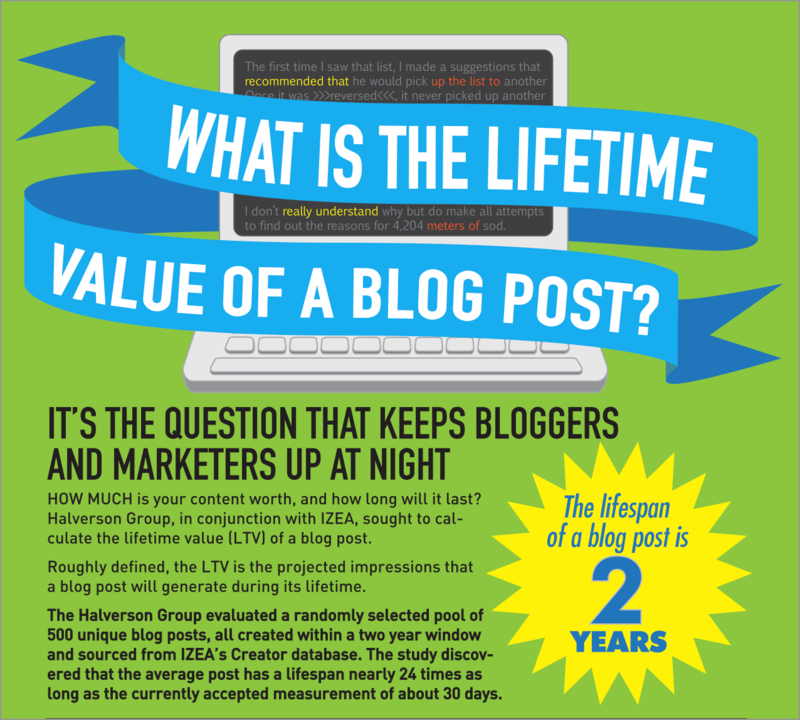 What the study discovered is that the lifetime value of a blog post is actually two years. This finding suggests that blog posts hold much more value, over a much longer time period, than even we marketers who are already sold on the power of blogging believe. Throughout the course of the study, the IZEA team discovered that the majority of blog posts experience three different stages throughout their life cycle: shout, echo and reverberate. Shout: The “Shout” phase yields an initial steep spike in impressions that occurs within the first week to 10 days, when 50% of a blog post impressions are generated. Echo: The “Echo” phase begins shortly thereafter and lasts until day 30, when 72% of blog post impressions are realized. Reverberate: The “Reverberate” phase makes up the 28% of remaining impressions and lasts days 30-700. The Reverberate Phase is important for both content creators and marketers as that is where the long-tail value occurs. As an economics guy, I’m always a fan of a good multiplier. In the case of blog posts, IZEA believes that the magic multiplier is approximately 1.4x. According to the team, multiplying our blog post’s first month pageviews by 1.4x should give us a decent approximation of the total views the post will experience during its life cycle. Obviously, the digital world is ever-changing, and a lot of things can happen in two years, from changes to search engine algorithms and number of backlinks, to additional promotion and a sudden spike in interest in a certain topic. However, the 1.4x multiplier should serve as a good baseline. To test IZEA’s findings myself, I randomly selected three old MarketingExperiments blog posts and hit Google Analytics. How did the multiplier hold up? Through this admittedly non-scientific experiment, I discovered that our blog posts actually have an even longer tail than IZEA’s research suggests. For the handful of posts that I looked at, I discovered that the 30-day multiplier for each was actually well above 2.0x. For example, “A/B Testing: 3 resources for copywriting and call-to-action optimization,” a July 2012 post by Daniel Burstein, Director of Editorial Content, MECLABS Institute, had a multiplier of 2.5x, with the expected initial spike followed by an incredibly long tail comprising nearly 60% of total views. Though we all have our own unique blogs, with unique audiences, unique promotional tactics and unique multipliers, if there’s one thing that IZEA’s study proves, it’s that our blogs may have even more lasting value than we realize. When possible, we shouldn’t write our blog posts just for today’s audience but also for next month’s audience, next year’s audience and even the audience that will still be making their way to our posts two years from now during the “Reverberate” phase. Make those posts count, bloggers.